Race riots, desecrated bodies, classism and long buried secrets - all dug up when searching for the secrets of how my town got its name, and the trail lead me 600 miles from Brownsville, Texas, to Alexandria, Louisiana. Every year I tell my students the story of “How Brownsville Got Its Name,”more-or-less as it was told to me by the late Bruce Aiken, a Texas historical commissioner who had the uncanny ability to tell you exactly what was important about any given date in South Texas history purely by memory (by the time I met him, he’d long since lost his ability to see the tiny print in the texts he used to pour over). And while it’s easy to say Brownsville was named after Fort Brown, which was in turn named after Maj. Jacob Brown, things’re never quite that simple. It all traces back to a forgotten soldier named Horace Weigart. It seems Gen. Zachary Taylor - who would later go on to be president - promised the men at the camp on the northern bank of the Rio Grande that he would rename the fort - then-called Fort Texas because they always called new forts in Texas, “Fort Texas” - after the first man to die in battle against the Mexicans. Shortly afterwards, his body was moved to a medical tent as the battle continued. Then another volley came over the wall, landing on the tent, knocking Weigart’s head clean off. They moved his body to a shallow grave, only to have another shell land there. Weigart had died three times in the name of his country. Shortly afterward, Maj. Jacob Brown, the commanding officer, was struck by another bombardment. He died three days later and was burried next to Weigart. Taylor returned and learned there had been two American fatalities- an enlisted man, and a fairly wealthy commissioned officer. Guess who he decided to name the fort after? A few years later the town was formed and named in honor of the fort - but Weigart’s problems continue. You see, they established Brownsville National Cemetery at the fort, much like Arlington and other famous cemeteries, special permission was needed to be buried there, the primary requirement being that you were a war hero. Weigart certainly qualified, but the cemetery did not end up being as eternal a resting place as one might expect. Fort Brown became fairly prominent as a training facility for soldiers, all the way up until the Spanish-American War, but the town - which was at the time primarily Anglo - was not fond of the idea that colored soldiers (at the time the Army had segregated regiments) were allowed to train at the fort as well. The city passed an ordinance in 1906 forbidding the black soldiers from leaving the base at night. As I posit it to my students, imagine you had volunteered to defend your country, and then were told you’d be grounded every night? The next night, a shot rang out into the night, screams were heard, a man ended up dead. The townspeople claimed a riot had taken place, and that the black soldiers had attacked the town. They demanded the soldiers admit what they did. They refused. Internet darling Teddy Roosevelt demanded the soldiers admit what they did. They would not. Finally, the soldiers were dishonorably discharged, losing all privileges and future benefits. Eventually an investigation took place, and it was clear the soldiers could not have done what they had been accused of. Naturally, all 167 soldiers were forgiven - in 1972 when Richard Nixon gave the only two surviving soldiers honorable discharges, but only one received any kind of financial benefit. How does this affect Weigart? Simple: the town now had an issue with the fort and demanded its closure. 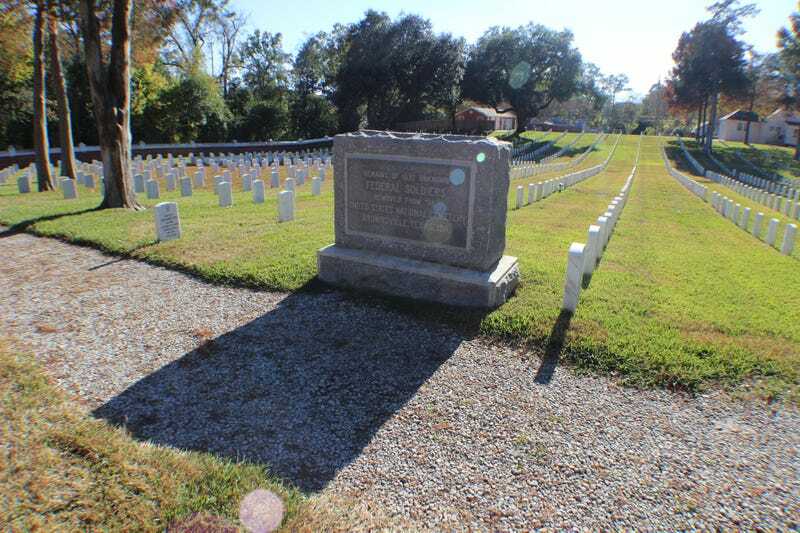 Without the fort, the city was now in charge of the cemetery, and they wanted nothing to do with it, so in 1911 they paid a company to move the entire thing as far away as possible - Alexandria, Louisiana. And take a look back at that stone at the top of the page. Notice it says, “remains of 1,537 unknown federal soldiers,” all supposedly buried there? That stone is intended to mark the remains of 15 hundred men (to say nothing of the over 3,000 originally in Brownsville), and yet next to it are new stones of new graves, some as recent as the 1990s and early 2000s. Some soldiers did get their names on stones, however, including Brown. Notice how I said “supposedly” and “intended” up there? See, things get worse for Weigart. You see, when they were digging up around the dorms around the college, which used to be an old hotel, which used to be part of the fort, the discovered something. They moved the cemetery, but it seems they didn’t move the bodies. Although not confirmed as those of the soldiers, if the graves were not moved - presumably including Weigart - that means they are still under the buildings of Texas Southmost College (which includes parts of the old fort, including the old morgue, cavalry building and others), so they can’t be reached without completely tearing up the campus. And they say the place is haunted. Ah, but it still gets worse for Weigart, at least somewhat. Inside the front hall of the Texas capitol in Austin is a plaque commemorating all of the U.S. soldiers who died in the Mexican-American War. Guess whose name they left out? It’s hard to read that faded stone, but it says more unknown soldiers are supposedly interned there. These from Fort Ringgold, which, 100 miles away from Fort Brown and 7 years before the “Brownsville Affair,” had a similar racial conflict between black soldiers and predominantly white residents. Their cemetery was also “moved’ in 1911, so presumably when Brownsville moved theirs, these guys did likewise.